IQMS is very intuitive and has some excellent tools. The support desk is top notch! I usually can figure out what the problem is just by looking at the help files or user group. If that doesn't work I know I can always call the support desk. Our company has been using the system for over 20 years. We were fortunate enough to be able to give a lot of input on the development of the system. Because the company has expanded so much we don't really have that option anymore. Make sure that you have a dedicated person in house that users can contact. The person would be the administrator of the software and could also provide any custom reports/labels that are needed. The system has helped us tremendously with managing our inventory control, Purchasing, EDI, and many other things. If we did not have EDI integrated into the system it would require the outsourcing of another company or person full time. The best part of IQMS is the simplicity of the interface when it comes to navigating between modules. There isn't really anything i dislike about the software. At Pod Pack International, IQMS solves our workflow problems concerning the flow of sales orders to invoicing. There are numerous benefits that have been noticed including faster response times to approving sales orders and ordering accurate amounts of materials off the material exceptions list. This then reduces production line downtimes and allows orders to be filled in the allotted time. IQMS is an easy to learn user friendly software that allows you to track all your purchases and shipping documents. It also allows you to keep quotes and POs that are sent from clients. I love how it organizes everything to your settings making it quick and easy to open documents after they are uploaded. It can be very overwhelming if you've never used it at first. It did take a while for me to get use to but after using it I was able to learn. The help menu could use a little work maybe with pictures showing you where certain tools are located. IQMS has training and online tutorials you should have one person in your company be the lead trainer and learn the software than he or she can reteach it to those who need it. Able to pull up old documents and using them to continue to order parts for the company allows us to not worry about if we are running out of a raw material. We can set alarms and alerts to fire off letting us know when it is appropriate to order including the lead time. IQMS can do everything from reminding you daily maintenance/PM to ordering parts. IQMS does orders for incoming and outgoing while setting up all the logistical analyst. It can help you with everyday task and can pull tags to help you better analyze what functionality is capability of being tweak to increase efficient in your processes. Because there is so much to offer IQMS can be a little overwhelming at first. If you are a first time user and you are use to your old programs it has a learning curve. You are not always allowed to set up all your short cuts or tools to help you accomplish whatever task you are set out to do. IQMS has lots to offer and with all the tutorials and live chats with service people you are able to fully understand the power of the software. It dosen't take much to learn and daily usage will allow you to find short cuts and make you a better user of the software and confident in it's ability to achieve your task. They have handheld units and scanners that can be used on the manufacturing floor this can be intergrated with IQMS. IQMS is connected to all of our sales team globally. Because of this our sales team is able to answer and and put in PO which updates real time in our manufacturing facilities. This allows everyone to be on board at the same time and we are able to communicate the exact PO and what is needed for our clients and field employees. IQMS has most modules built in to run a manufacturing business. IQMS does not have a mobile connection, at least at my facility. Internal part numbering is limited to 25 characters. IQMS has the ability to keep customer records, production traceability, quality management, and document control systems, financial records. It is really a one-stop shop solution to help run a business. IQMS allows us to track production, schedule production, maintain our customer database, Quality Control records, document control for all areas of the company. IQMS is used in just about every sector of the organization here in Twinsburg. "Innovative software to boost organization in the Plastics Industry"
What I like best about IQMS is that it is a truly, all-in-one software. It can be tailored to fit anyone and everyone's needs from accounting, to production, to warehousing, to quality, and everything in between! This software was designed by people that really know the plastics industry and it shows in everything about this product. One of the biggest struggles my company has with this software, is that there is so many details and buttons that we have no idea what they do. It can be very easy to get lost in the details and go down a rabbit hole all day trying to find out what the click of one toggle button can do! However on the bright side, IQMS has fantastic support over the phone, through Team Viewer software, and also in the software. We use this software for every section of our company. From the time we get a PO to manufacture a part, all they way through the delivery of the order we have complete trace ability of everything from the raw material used to make the product, to when the customer is consuming these goods. One of the largest benefits I have realized as a Quality manager, is that completing corrective actions and customer interactions is a breeze by being able to help a customer with any issues they have with our product, if they can give the slightest detail about what box or order the parts came out of. From there, I can trace down to the exact box the bad part was in, see who was running the machine, see what raw material was used, and be able to update the customer with feedback in a few minutes of what may have caused the bad product! I can always call them for whatever questions and they always offer good support. We were looking for a system that gave us better visibility in all of our processes - Accounting, Sales, Production, etc. With IQMS we have been able to achieve this and understand where our trouble spots are and tackles those. "Okay System - Lacks Sophistication of some other ERPs"
It's a very user friendly platform, and is understandable from the get-go. It seems to lack the sophistication of other ERPs - IE SAP. It is almost too open to user input/tweaking. IQMS is used by our organization for all reporting purposes - mainly financial. I like that everything we want to do with our business, the software can help. And every bit of data or detail we'd like to see, is there. There are some areas of the modules that are not as flexible and we have to find a work around to make it fit our business practices. We have full visibility of our costs and efficiencies (or inefficiencies). "Well Rounded ERP package "
No direct link to integrate Gmail apps for business to store email communications within IQMS. This function only works with Outlook. We were SagePro and COSS mfg users. 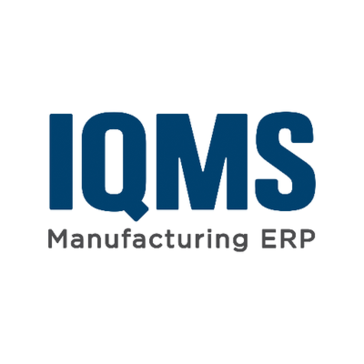 IQMS combined our accounting and manufacturing systems. This allowed us to gain greater insight into our costs or manufacturing. It allows us to drill down from a Bill of Materials to individual materials to check if items are in stock very easily. "IQMS overall a good program"
Users are able to figure out the program with minimal training. The screens update fast and are then visible among different departments. This makes scheduling, inventory control, etc easy for everyone. Discussion boards and visual training that is available also help to get everyone up to speed and for refresher trainings. It can be hard to add one-off products to the system and keep a trace of that later on. Complicated BOMs with many components can also be hard to manage across different departments by only using the program. The software works great! Never had any issues! nothing, it works really great couldn't be happier! Our business has many problems and they are all solved with IQMS couldn't be happier with the outcome! Great product! I work heavily with IQMS creating projects, maintain customer release and sales order, reviewing inventory and production. Scheduling and transactions. Projects in IQMS do not flow correctly and the inability to modify dates, flow chart and gant chart become disorganized. Helping us with real time production, managing our inventory transactions and sales order creation. All areas of IQMS are very user friendly. Nearly all tasks are very easily completed. Sometimes some small fixes can be difficult to to figure out. Help option is very useful though! Easily the best operating system I've used. Greatest benefit for IQMS is inventory tracking and data entry. "Love the product and would recommend it to you!!" I used other software in the past for controlling documents and files and have found this to be one of the easiest to use. The problem is having a dedicated person running the software. its not the best at standalone function. if using other programs to do this kind of work you would be happy on how easy this program is to learn and take over your other programs you are currently using. less downtime on the floor and way better document control within the building. It integrates our entire business together, including automations that would not be possible otherwise. "LIKE THE PRODUCT AND HOW EASY IT IS TO LEARN TO USE"
EASE OF USE AND UNDERSTANDING OF THE PROGRAM, VARY EASY TO LEARN. THE WAY IT CONTROLS IMPORTANT DATA AND INFO IS A PLUS. BEING A ALL IN ONE SOFTWARE I THINK IT COVERS LOTS OF AREAS. ITS A GREAT PROGRAM TO USE AND LEARN. IT WILL TURN THINGS AROUND FOR YOU!! Straightforward user intereface for inventory control, BOM structuring, routing/assembly procedures, and creating product test reports. Rev control is good which helps with ISO audits. Also good for updating BOMs for several products at the same time. There are some program bugs and may freeze. Program may be pricey for smaller companies and ROI may take a while. May take some training to get employees up to date on using the program. Inventory control/testing. BOM structuring as well. It’s a very good purchasing software where you can set it up to fire off pms and spare parts orders. Learn it. It can be super useful and can do almost everything. It’s great! "Great BOM control and inventory software"
I wish the program would not cost as much as it does and would run more by a stand alone . Suited for manufacturing. Many default reports. "Great Support and Continuing Innovation"
Ease of information access. The technical support offered is unrivaled. The company is driven towards constant improvements. All business information housed within one program! There are many automation options from order entry to real time scheduling in the warehouse. This program requires a specialized resource to fully understand the program and use its features. We use it for quoting, production and testing. The automation has helped reduce time and paperwork. "Easy to work with UI, the software is comprehensive for all business needs." The ease in implementation and how easy it is to find mistakes that have been made. The software does not stop our production team when they make mistakes. Business flow is, overall, easier to understand and visualize with IQMS. * We monitor all IQMS reviews to prevent fraudulent reviews and keep review quality high. We do not post reviews by company employees or direct competitors. Validated reviews require the user to submit a screenshot of the product containing their user ID, in order to verify a user is an actual user of the product. Hi there! Are you looking to implement a solution like IQMS?